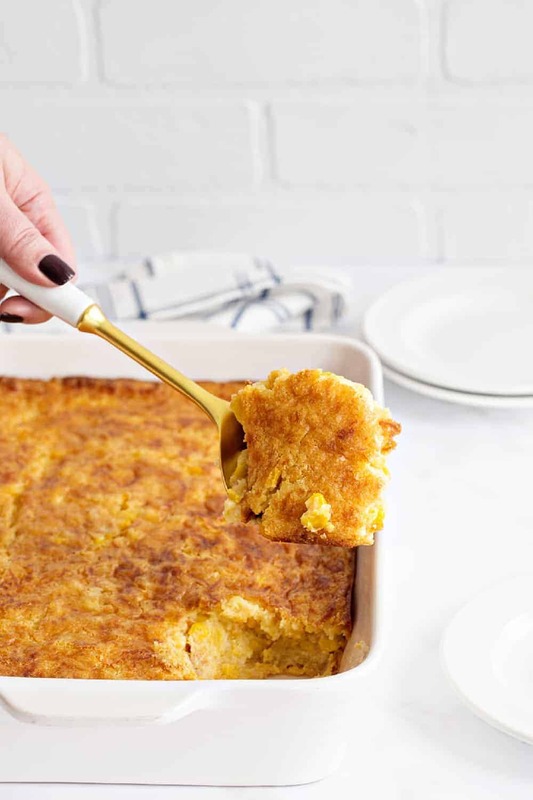 Easy Corn Casserole is a must-make addition to any holiday table. This version will become a family favorite – no need to tell them how easy it was to make! This post is sponsored by Fleischmann’s® Simply Homemade® Baking Mix. Thank you for continuing to support the brands that make My Baking Addiction possible. With the holiday season in full swing, I decided that I wanted to start sharing some of my absolute favorite family recipes. Pretty much everyone in my family has their own signature dish that they bring to our holiday table every single year. My Aunt Debbie is famous for her mini crescent dogs, my Step-Mom is known for her Cranberry Fluff, our cousin Lorrie makes the best glazed carrots ever, I’m the mashed potatoes and gravy girl, and my mom’s specialties are deviled eggs and corn casserole. Even though my mom has been whipping up this corn casserole for years, I had no idea how easy it is to make until I asked her for the recipe earlier this month. It’s really just a handful of super simple ingredients that combine to create the most delicious casserole. And I swear it gets better the longer the flavors meld, so it is perfect for leftovers. It’s so good that I eat the stuff cold, straight from the fridge. Just sayin’! 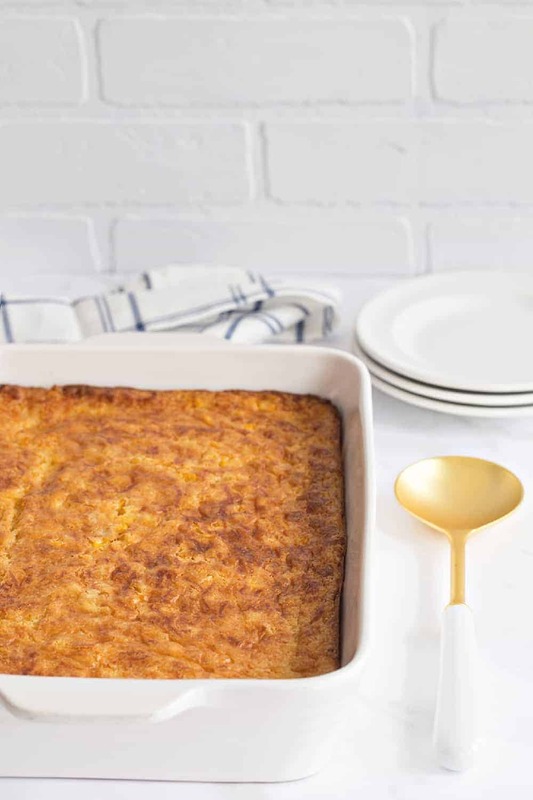 Some people love this Easy Corn Casserole fresh out of the oven, but personally I like to let it sit at room temperature for a bit before serving. I’m also team sweet corn, so I add just a bit of sugar to the batter to sweeten it up. However, you can totally go a more savory route by omitting the sugar and adding in a can of green chilies for Southwest kick. When you love spicy, what could be better than corn, green chilies and cheese? As much as I love my mom’s corn casserole recipe, her go-to mix isn’t my favorite, but I also hadn’t found anything else I liked better either. So when my friends at Fleischmann’s® introduced me to their Simply Homemade® Cornbread Mix, I was pretty excited. 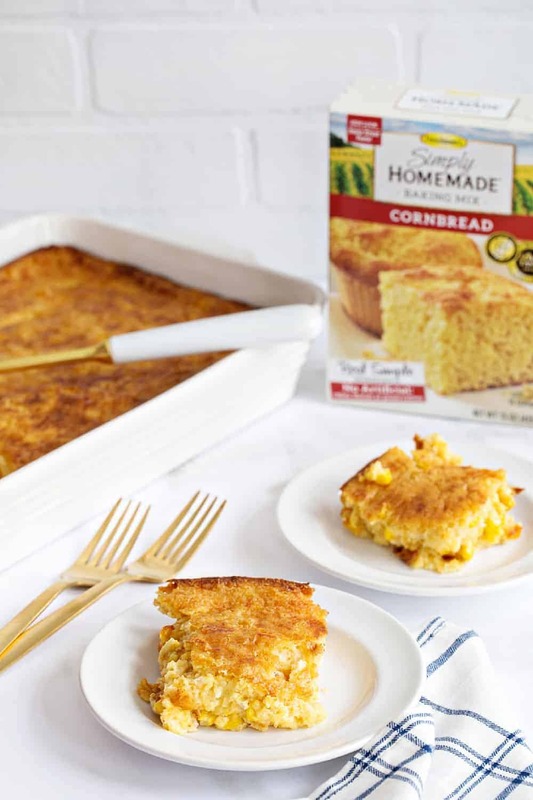 Fleischmann’s® Simply Homemade® Cornbread Mix uses a handful of high-quality ingredients. Honestly, they’re the same ingredients I would reach for in my own pantry if I was making cornbread from scratch, just in a convenient one-stop-box. Simply Homemade® Cornbread Mix is made without artificial colors, flavors or preservatives. It’s the easiest way to make cornbread that tastes homemade. 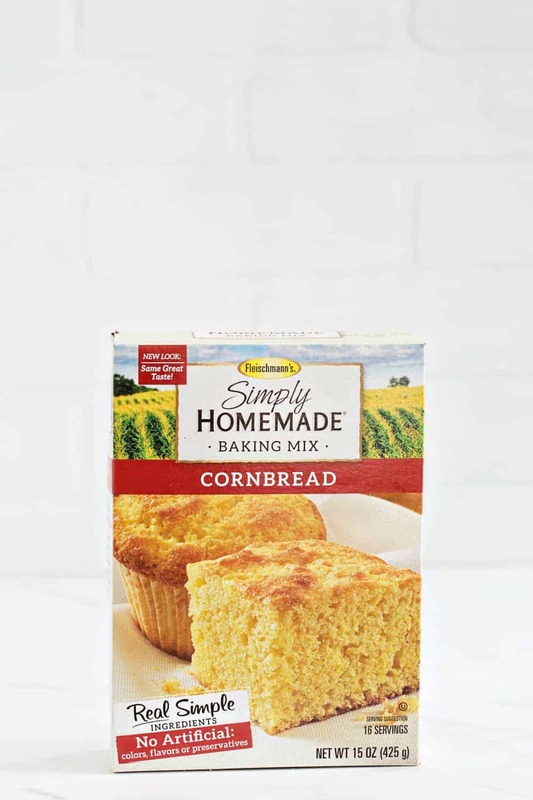 It would be delicious as muffins or for cornbread stuffing, but for me the Simply Homemade® Cornbread Mix is the perfect base for my mom’s Easy Corn Casserole recipe. Adding just a handful of ingredients, such as butter, corn, sour cream and eggs, we can turn this mix from cornbread into Easy Corn Casserole in the amount of time it takes for the oven to preheat. I’m a total planner, but this Easy Corn so simple to make that you won’t mind throwing it together the day of your big holiday dinner. 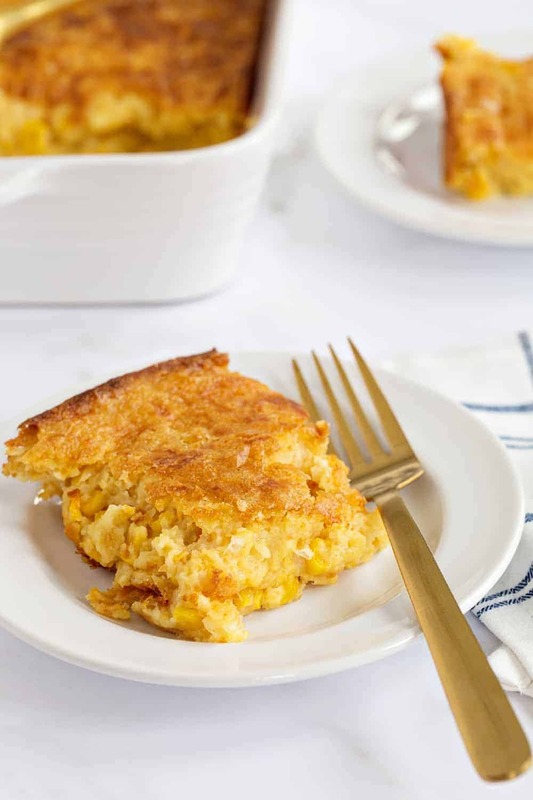 To make this Easy Corn Casserole recipe, simply mix together the corn and butter, then add the sour cream and lightly beaten eggs. Finally, add the Simply Homemade® Cornbread Mix. Then bake! Want to know a secret? Sometimes I mix together the batter for the Easy Corn Casserole in the same casserole dish that I’m baking it in. Because let’s be honest, having fewer dishes to wash makes me real happy. Whether Easy Corn Casserole joins Sweet Potato Casserole and Brown and Serve Rolls on your holiday table or becomes your new favorite accompaniment to chicken chili, this is an easy side dish recipe that you’ll come back to time and again. Butter a 9 x 13-inch baking dish, or spray with nonstick cooking spray. In a large bowl, stir together the corn, creamed corn, butter, sour cream, eggs and sugar until combined. 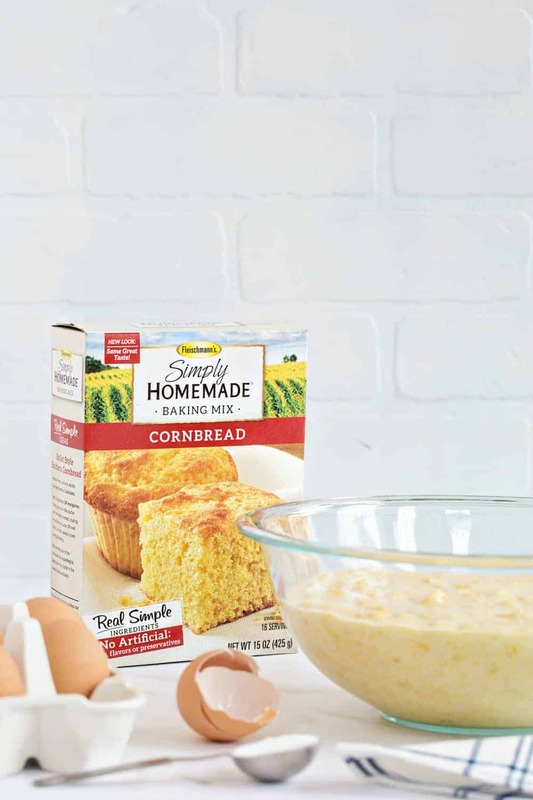 Stir in the Simply Homemade® Cornbread Mix until fully incorporated. Fold in the cheese. Spoon the batter into the prepared baking dish and smooth into an even layer. Bake in preheated oven for 1 hour and 20 minutes. The top will be golden brown and the center will have the very slightest jiggle to it. Remove the pan to a cooling rack and cool for 20 minutes before serving. Follow Jamie on Instagram. We love to see what you’re baking from MBA! Be sure to tag @jamiemba and use the hashtag #mbarecipes!